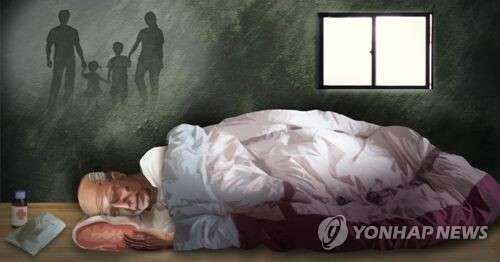 SEOUL, Oct. 26 (Yonhap) — The number of elderly people dying lonely deaths is increasing, especially for men, welfare data showed Friday. According to the Ministry of Health and Welfare, which released the data for a parliamentary audit, 3,331 aged people died over the past five years while living alone. The number was 538 in 2014, 661 in 2015, 750 in 2016 and 835 in 2017. As of end-June this year, 547 people died such lonely deaths. The data showed more men died alone than women during the counted years: 2,103 to 1,228. Separate figures from Statistics Korea estimated that 1.33 million people of the aged generation were living alone last year. This is an increase from 1.15 million in 2014, 1.2 million in 2015 and 1.26 million in 2016. The figure for end-June this year is 1.4 million, up 17.9 percent from 2014. Of them, the biggest group of 345,524 people were aged between 75 and 79. There were 42,127 seniors who were aged over 90, the data showed.